Update: Responding to demands by animal protection organizations, including Friends of Animals, an inspection of Marineland by the Direction départementale de la protection des populations (DDPP, préfecture Alpes-Maritimes) hours ago, revealed hydrocarbon pollution in the orca tanks. The water analysis results contradict announcements by Marineland's public relations department, which insists that the "water is now clean and the filters are working." 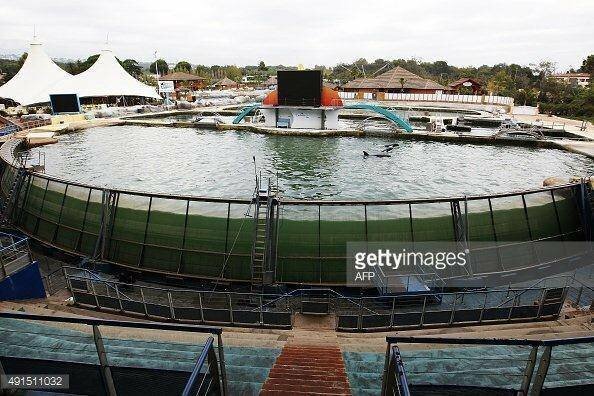 Scrambling to do public relations damage control, the Groupe Parques Reunidos Europe fired Bernard Giampolo, its director of Marineland in Antibes, France today, following the controversial death of Valentin, a 19 year-old orca. Mr. Giampolo leaves his post at Marineland after nine years. Jesus Fernandez Moran, director of Parques Reunidos Europe, will take over as interim director of Marineland, Antibes on November 2. Pressure from the animal protection movement is mounting on social media. A protest organized by Sans Voix PACA is scheduled for October 25 outside the troubled marine park. The death of the orca on October 12 followed a severe storm October 4, which killed 20 people and devastated 90 percent of the marine park, leaving its basins flooded with mud and many of its animals dead. Valentin's death was explained in a communiqué issued by Marineland as caused by "intestinal torsion" unrelated to the storm. Several animal protection organizations, including Sea Shepherd, Friends of Animals and the Fondation Brigitte Bardot do not accept the explanation and are asking for an independent investigation as well as the immediate closing of the marine park, claiming the only information regarding the dead and surviving animals at Marineland is coming from the very people responsible for their welfare. Only certain journalists have been allowed inside the ravaged mud-filled marine park. John Hargrove, an ex-employee of Marineland who knew Valentin, accused the marine park of "killing him." 'He was sociable, sensitive and intelligent," said Mr. Hargrove. "He suffered since the day he was born and had he been in his natural habitat, the sea, he would have felt the currents and followed the calls of his kind, swimming out of danger." Marineland has admitted that its land animal petting zoo was completely wiped out by the storm and that animal deaths included goats, sheep, and birds. There is concern among animal protection advocates that the remaining orcas will also die, stuck in their contaminated tanks. Photos of another orca at Marineland show him sick and suffering in a dirty tank. The is little doubt that the polemic surrounding the deaths at Marineland fueled by the fury of animal rights advocates on social media hastened Mr. Giampolo's removal. Yvon Godefroid of the organization Dauphins Libres, claims that Valentin died "of desperation" and had been banging his head against the walls of his mud-filled enclosure in the days following the storm. Mr. Godefroid also states that on the very day Valentin's mother died on June 20, in the same marine enclosure, allegedly of a heart attack, Valentin was forced to perform tricks for food. "He didn't get even one day to grieve his mother," wrote Mr. Godefroid. "The show had to go on." 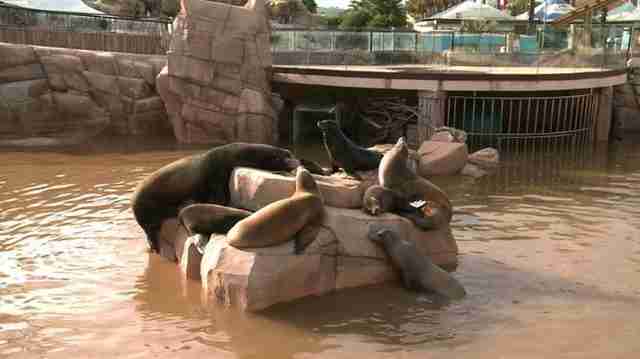 Mr. Giampolo was removed from his duties at Marineland in Antibes but he is being transferred to Parc Mirabilandia, one of the groups marine zoos in Ravenna, Italy. "He was fired from Marineland but he'll continue to abuse animals where they have transferred him," said Edita Birnkrant, of Friends of Animals. "He's only been inconvenienced by having to move from the Riviera to Italy. Meanwhile, the remaining orcas might die in filthy tanks. He should be fired period." "They're like the Catholic Church," says an animal rights activist who protests regularly at Marineland in Antibes. "They don't protect victims by delivering their criminals to the police; they just move them around so they can abuse victims elsewhere. It's nothing but a shell game." Repeated calls to Marineland for comment went unanswered. See Friends of Animals' complaint here.